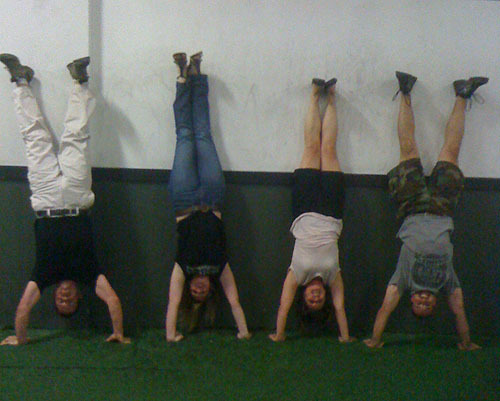 lamiki » Blog Archive » What’s the deal with handstands? What’s the deal with handstands? What’s up with those handstands? Handstands work your balance, strength, and flexibility, three important elements that are “CrossFit.” They’re something that we can do outside of the gym, on a whim, and without any equipment. In the woods? At a national landmark? In your mother’s backyard—do a handstand; have someone take a picture of it and share it with your friends online for all to see and comment on. It’s kind of like a gang sign as it shows your affiliation to a very specific group of people. If you search on Google, bing, or Flickr for “CrossFit handstand,” the SERP will turn up a number of photos of people inside a gym and at the most awesome places around the world. These are CrossFitters in their natural habitats, doing their thing. Because I can (sort of, I still have to kick up and lean against something). And because I associate myself as a CrossFitter. Against the safety rail at Wallace Falls outside of Gold Bar, Washington; April 2010 (not the most photogenic handstand). Against the race car at the 24 Hours of LeMons race at Thunderhill Raceway outside of Willows, California; May 2010. 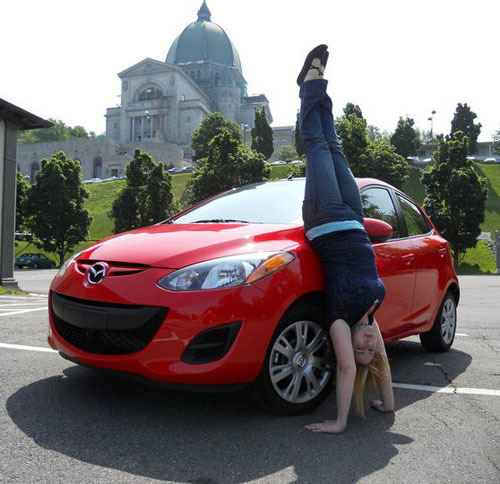 The first-ever handstand against a 2011 Mazda2 during the Mazda2 Lifestyle Drive in Montreal, Quebec, Canada; June 2010 (photo above). Inside Local’s Gym to celebrate my friend Kevin’s birthday, Lynnwood, Washington; August 2010 (photo below). Against the “big books” in the atrium at the enterance to Wordstock Book Festival at the Oregon Convention Center in Portland Oregon; October 2010. As you can see, I get around. And I plan to keep doing so, one handstand at a time. This entry was posted on Friday, November 26th, 2010 at 10:40 pm and is filed under crossfit. You can follow any responses to this entry through the RSS 2.0 feed. You can leave a response, or trackback from your own site.